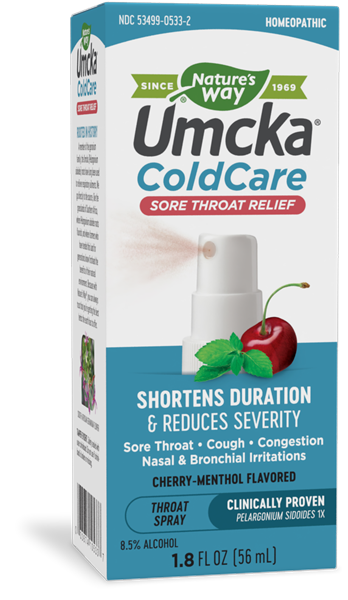 Umcka® Throat Spray - Nature's Way®. Shake well before use. For best results, use at first sign of symptoms; continue use for an additional 48 hours after symptoms cease. Adults & children 12 years of age and older: Apply 4 sprays into the back of the mouth 3 times daily. Uses: Shortens duration and reduces severity of symptoms associated with sore throat. Stop use and ask a doctor if new symptoms occur, symptoms get worse or last more than 7 days. Fever worsens or lasts more than 3 days.